I love old linen napkins. Soft and supple, I use them ironed or unironed. And they are great for crafting. I made a small bag, about 6 x 4 inches, to hang on a knob in my kitchen. Filled with a small juice glass and a few pansies, it makes a cheery sight by my sink. I added a few white buttons along the cuff. "Finally, brothers, whatever is true, whatever is noble, whatever is right, whatever is pure, whatever is lovely, whatever is admirable—if anything is excellent or praiseworthy—think about such things." She knits a sock, her first, lamenting the fact that once it's done she's only half finished. Carefully she knits and purls. The rows increase, she turns the heel. Her hands move in a rhythm familiar to her grandmothers. Graceful hands. Beautiful hands. La Tea Dah, over at Gracious Hospitality has wonderful posts about tea time. She's asking everyone to participate with recipes for special goodies, just for tea! Sift flour, baking powder and salt. Add sugar. Cut in butter until the mixture is like coarse meal. Combine the milk and egg and stir into flour mixture, mixing lightly. On a floured surface, roll out to 1/2 inch thick. Cut 3 inch rounds and place on greased baking sheet. Bake at 350 degrees for 15 - 20 minutes or until lightly browned. Serve warm with butter or strawberry jam and Devonshire cream. In this picture, I cut them a little smaller than 3 inches, and I brushed the tops with more milk and sprinkled a little sugar on them. I also used homemade cherry jam instead of strawberry and lightly sweetened whipped cream. These scones and a cup of tea made up most of my supper last night. And tea is tea only if made in a pot, never drag a bag through hot water and call it tea. And somehow, it tastes best when sipped from a bone china teacup. The Empress Hotel overlooks the Inner Harbour in the downtown area. Tea is taken in an Edwardian style room. The first time I had tea there, my daughters and I were seated at a table by a window. We had a gorgeous view of the harbour and of people wandering along the street. Tea begins with a dish of strawberries and chantilly cream with unending pots of hot tea, an Empress blend. Then a 3-tiered stand is brought, with sandwiches on the bottom, scones in the middle and sweet goodies on the top. It's the most civilized of experiences and so much fun! The Empress was named after Queen Victoria. You can see queenly references everywhere, including on this stone gatepost when you enter from the side. Climate change I can believe, but global warming...? It's a little hard to swallow after yesterday's snowstorm! Huge, fat flakes pelted down. Nothing really stayed, but baby, it's cold outside! I retrieved my winter jacket and scarf from the back of the closet for our evening walk. This was the scene from our second story window yesterday, before the majority of the snow fell. Today is sunny, but still chilly. We just got home from church and after lunch I'm going to bundle up and poke around the yard a little, searching for signs of spring. As a toddler, my husband received this silver fork and spoon from his grandparents. His name is engraved on the handles. Rather than let the pieces languish in a drawer, I found a shadowbox, covered the back with coffee-coloured moiré fabric and mounted the cutlery with a little hot glue. I'm all for simple and this is it. Hanging on the dining room wall next to a framed piece of tatting, this speaks to me of family, of heritage and of beloved people passed into the next life. Well, I made it just under the wire for ArtsyMama's Vintage Party Swap. I mailed my box yesterday to Kathy. Here's another peek at what I sent. I had fun with this theme - floral was Kathy's choice. My husband's grandmother did amazing needlework. She was born in 1900 and died about 1988. I don't have much of her handiwork, but I treasure this sweet celluloid doll. It's a sewing box, small enough to hold just a few precious items. The skirt divides to reveal 3 tatting shuttles, two celluloid and one metal. A bit of tatting started by Grandma. Do any of you tat? It's something I would like to attempt one day. I wrote this post on Friday and tried posting it, to no avail. So my brilliant words were lost and these are the replacement. I won this beautiful piece from Lilli. I've been hanging it in different places, wanting to enjoy the colours everywhere. But for now it will stay hanging on a shelf in my office/studio where I can look up from the computer and watch it shimmer and gently sway. Lilli also included a few other goodies - several "L" items and a soft creamy crocheted flower. Such sweetness. Thank you, Lilli. I haven't made one of these in a long time. My husband loves them. Youngest daughter won't eat a bite. I had a hankering for the taste of lemon meringue pie yesterday so I spent a happy hour puttering in the kitchen. On the spur of the moment I called our son and his wife and they joined us for dinner. Lemon pie is his favourite as well. His wife doesn't like it, so she joined youngest daughter in having a scoop of red raspberry sherbet instead. I tried making pastry the oil method. It worked well although the pastry doesn't hold together very well. But the pie...oh the gentle lemon pucker, smooth texture, marshmallowy meringue - it all combined into a wonderful experience. I don't use a packaged lemon filling, but the recipe from Betty Crocker's red covered cookbook that I got as a bride 31 years ago. The page is stained signifying the amount of use it's received. Freshly squeezed lemon juice, eggs, sugar, cornstarch and water is all it takes. I am enjoying the spring season in spite of my recent posts. But at the same time, I long for sunnier days of real warmth. 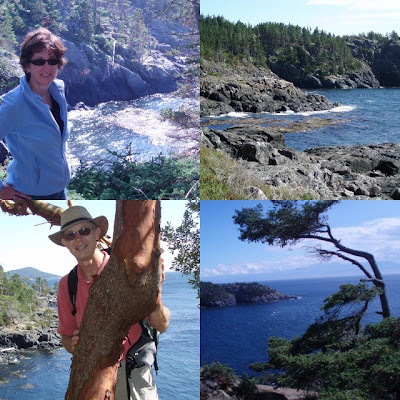 This is a group of photos from a Sunday afternoon hike along the Strait of Juan de Fuca. Utterly gorgeous. "Grace overflowed from God's loving heart." Before...Two walls in the living/dining room (L-shaped) were painted a deep navy blue. I loved it, especially in the winter time. The colour provided drama and a sense of coziness. But after 5, almost 6 years, I was ready for a change. After...The week before Easter we painted the navy walls the same pale blue colour as the other walls. I really like the light, airy feeling in the room. It looks so much bigger! In a way, though, the room has lost some of its drama. That's okay, but I'm considering a few other changes to compensate. I also had a bunch of gold-framed prints hanging on the walls. I took those down and repainted them black, except for the one leaning on the mantel. It has some black marbling in it. I repaint picture frames all the time - why purchase new? I paint the mats as well, although some consider that heresy.